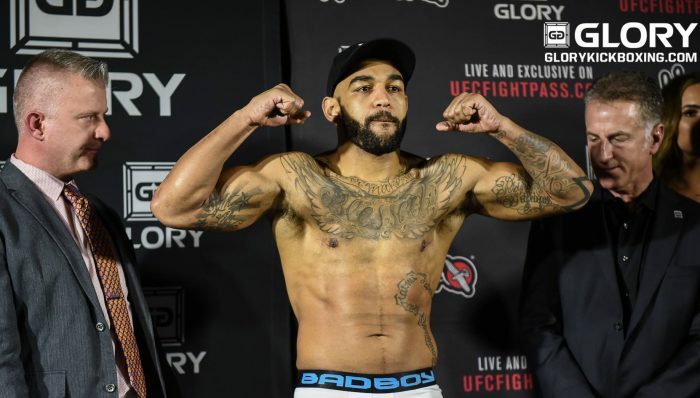 Jason Wilnis retained his GLORY middleweight title against Israel Adesanya at GLORY 37 Los Angeles but the decision left countless kickboxing fans on social media at loggerheads as to how a unanimous decision was awarded to the defending champion. If anything, there was nothing unanimous about the controversial decision awarded to Willis who, in typical fashion, fought with a tight high guard and kept coming forward with venomous low kicks and aiming punches for Adesanya’s head. The skilful “Stylebender” was was more varied with his striking output (even throwing Saenchai style cartwheel kicks and some nifty spinning kicks into the mix) with plenty of strikes aimed to the body and head of Wilnis whilst displaying his confident ring-craft and not being a sitting target despite, being in a much smaller ring than usual compared to GLORY Kickboxing events in recent years. If the early rounds might have been slightly in favour of Wilnis, the same cannot be said for the reminder of the fight as the rounds progressed. The champion was lacking the effective high volume of output that was being more obviously applied by Adesanya. Although the continuous forward pressure and counter attacks from Wilnis were always present, it was Wilnis who was starting to fade in the latter rounds and the challenger who, remained composed, slick and actively efficient enough to have edged the decision in his favour and be crowned the new middleweight champion. However, when the official decision was announced confirming Wilnis as the defending champion, two of the judges had scored the fight as 48-47 for the champion but bizarrely one judge had scored it as 49-46 for Wilnis. An immediate rematch might be the most obvious thing to call for as a result of the controversial decision, however, it was announced by the commentary team that former middleweight champion, Simon Marcus, was set to face the winner of the main event of the night; and later confirmed by Marcus himself to Michael Steczkowski. Yoann Kongolo won the 4-man welterweight tournament to set himself for a second rematch with the new GLORY welterweight champion, Cedric Doumbe who, had recently defeated Nieky Holzken by decision at GLORY Collision. Although Kongolo was the obvious favourite to win the contender tournament, his emphatic performance in the final with a brutal body shot to drop Karim Benmansour will send a firm warning to Doumbe who, he has twice defeated before by decision. Zoila Frausto won her GLORY debut by decision in a slug-fest with Daniela Graf and although both ladies might have got a bit punch drunk in their fight, neither was willing to back down and both were fully committed to punching the other’s lights out. Frausto who, is a Muay Thai champion and MMA fighter, certainly is the calibre of fighter that looks set to make a bigger impact in the women’s super bantamweight division this year. Also, Tiffany van Soest was re-presented with her super bantamweight belt in-front of her fellow South Californians. It might seem as if GLORY are being smart with their selection of American female fighters but so far, both van Soest and Frausto are two female fighters that no kickboxing promotion can go wrong with at this early stage of developing their women’s roster. Unfortunately, it wasn’t to be for Matt Embree who, lost by TKO in the fourth round against former featherweight champion, Robin van Roosmalen. Yes, former champion – van Rosmalen had missed weight by under one kilogram at the weigh-ins the day before and refused the opportunity to try again when a time extension offered. As a direct result, GLORY immediately decided to strip their champion before he even made his first title defence. However, had Embree won he would’ve been awarded the title but since he didn’t, van Roosmalen has now secured his number one contender status and will now fight again for the title in the near future against an opponent yet to be confirmed. Could a rematch between Robin van Roosmalen and Gabriel Varga be in the pipeline anytime soon? Only time will tell especially as Varga had confirmed last year that he’d been informed by GLORY that the promotion were planning on hosting future events in Canada come 2017.